Venezuelan National Guard troops block the entrance of humanitarian aid into Venezuela on Saturday near a bridge on the Venezuelan-Colombian border. DIMATTEI: Tim, there's a lot of confusion, especially among Venezuelans here, about what if anything Guaidó and the opposition accomplished over the weekend. Their effort to push humanitarian aid into Venezuela largely failed. So did their hopes that a much larger chunk of the Venezuelan military would just abandon Maduro and come over to their side. Was this a setback for them? PADGETT: Yes and no. Those images Saturday of Maduro doing a victory salsa dance in Caracas - because the aid didn't get through his military blockade - certainly confirmed that he's not going to be overthrown anytime soon. And I do think Gauidó and the Trump Administration raised very unrealistic hopes that this was somehow going to be a fall-of-the-Berlin-Wall moment for Venezuela. But opposition leaders who were there on the Colombian border told me by phone they do believe they won the very important optics war. Maduro may have done of a victory dance - but it was a pretty disgusting one, considering that his forces reportedly burned truckloads of food and other basics that millions of Venezuelans desperate desperately need, and that Maduro's forces did fairly brutally attack the people trying to get that aid in. So Guaidó and his lieutenants came out confident the U.S. and the international community are even more appalled at Maduro's dictatorship. READ MORE: Diplomatic Defections, Petro-Pressures: Where Is the Venezuelan Crisis Headed? Florida's U.S. 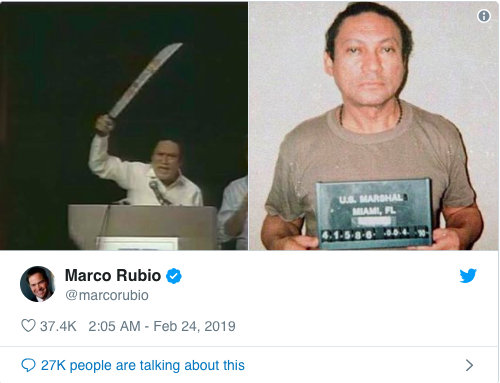 Senator Marco Rubio even tweeted pictures of dictators from the past, like Panama's Manuel Noriega, in relation to the Venezuela crisis. What was Rubio trying to say? He was trying to send a message that, frankly, a lot of people don't think is very helpful right now. He was trying to suggest that Maduro is now giving the U.S. a pretext for taking the same action against him that we took against Noriega back in 1989. You'll remember we invaded Panama and threw Noriega in prison here in Miami. Rubio believes the threat of U.S. military intervention strengthens Guaido's hand. But unfortunately it also helps Maduro. Rubio believes that kind of threat strengthens Guaidó's hand. But unfortunately, it also helps Maduro, because it allows him to say to Venezuelans and to the world: "See? This is this isn't Guaidó's operation. This is Trump's show." That can undermine the credibility of the opposition cause. And you reported that even Guaidó and the opposition are now using phrases like "all options are on the table," including U.S. military intervention. Did that surprise you? Yes. 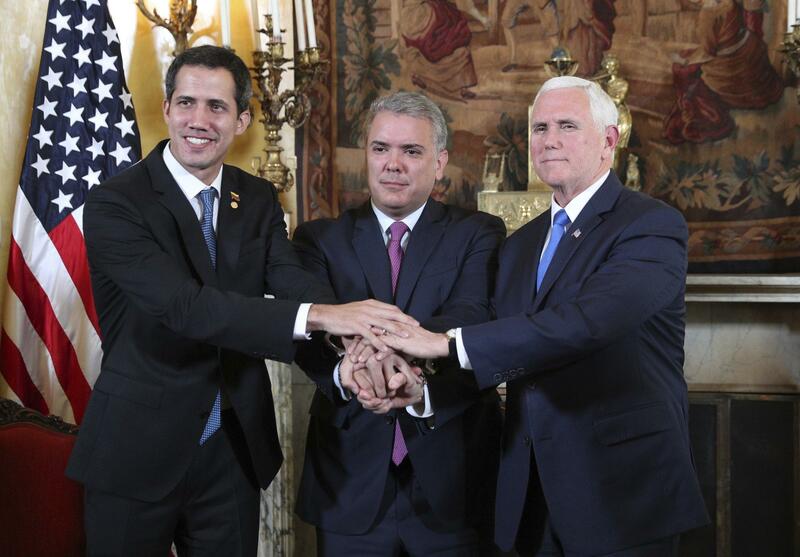 I think any hint from Guaidó that he's looking for outside military force, instead of international diplomatic efforts, to restore democracy in Venezuela just plays into this narrative from Maduro that Guaidó is a puppet in Trump's scheme to carry out a coup and steal Venezuela's oil. But ministers from the Lima group - that's the group of Latin American and other hemispheric countries working to pressure Maduro - said at their meeting Monday in Colombia that military intervention must not be an option. Vice President Mike Pence was there and he, of course, repeated Trump's suggestion that that option remains on the table. But it was pretty clear that that kind of rhetoric is very unpopular with the Latin American governments the U.S. needs if it's going to be successful in this effort. So what did the United States and the Lima group decide to do Monday to tighten the screws on Maduro? Surprisingly - not all that much. The U.S. issued targeted economic sanctions against some more regime leaders. It called on the Lima group nations to impose their own sanctions on Venezuelan assets. They didn't do that - but they did suggest taking Maduro in front of the International Criminal Court. But there's not a lot more we can do beyond the serious action we took last month to cut off the billions of dollars Venezuela gets from oil exports to the U.S.
Venezuelan opposition leader Juan Guaido (left) with Colombian President Ivan Duque (center) and US Vice President Mike Pence in Bogota, Colombia, on Monday. Tim, you've said you feel that the Venezuelan opposition and the Trump administration need to look at historical examples, like the successful removal of Chile's right-wing dictator Augusto Pinochet three decades ago. Yes. I mean, Trump can threaten an invasion of Venezuela all he wants - but the reality is that dislodging dictators like Maduro is difficult and it requires time. As I said, we've pretty much used up the economic sanctions available to us. But I think they can work and now we have to let them work. In the meantime, the opposition and the international community have to do what they did in Chile and start moving Maduro - and more important the military that's keeping Maduro in power - toward solutions like a referendum on the regime, new presidential elections and things of that nature that can see Venezuela out of this crisis. And what do you make of the fact that Maduro briefly detained Univision anchor Jorge Ramos and his crew last night because he just didn't like the questions they were asking? It was just Maduro showing us yet again what he really is: a rather embarrassing dictator.